For positioning Screws it is necessary to control the error of the thread pitch. We provide customer Screws with an accuracy class of 50 (50μm/300mm), 100 (100μm/300mm) and Screws with a class of 200 (200μm/300mm) in C45. For standard carriage Lead Screws class 200 ones can be used. Complete irreversibility occurs with Trapezoidal Screw with helix angle < 2° 30′. In all other cases, torque may be transmitted to the drive gear when the screw is still, subject to a load on the nut (especially under vibration). However, good irreversibility is present up to 5 or 6 degrees. Materials used for the production of Nuts, (Bronze and Stainless Steel 316), are resistant to standard oxidizing agents, that occur in various applications. If corrosive agents are present please contact our Technical Department directly. 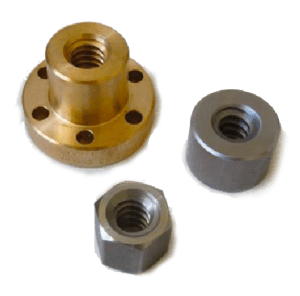 In applications where the presence of added lubricant (grease or oil) is not allowed we recommend the use of self lubricating Plastic Nuts. The use of Plastics is constrained by the actual working conditions. This is because Plastics sometimes have excellent self- lubrication features, but have at the same time, restrictions on working temperature or moisture absorption problems. They may also have some mechanical properties that may not be suitable for the intended use. A preliminary study of the application, is therefore recommended. Please contact our Technical Department.